A 50-foot-wide, 30-foot-deep sinkhole destroyed a barn, killing two horses despite rescuers' desperate efforts to save the second one Friday. Bob Bonwit had returned home from his nursing job Thursday night and was walking to his barn to feed carrots to his horses when he discovered the sinkhole had engulfed the barn. "I nearly stepped into it," Bonwit said. "The whole world was wrong." The horses were at the bottom of the pit, which was filling rapidly with groundwater. By the time Seminole County sheriff's officials and other fire-rescue personnel had arrived, the older horse, Jack, 17, had drowned. The other horse, 13-year-old Magic, was perched atop the dead horse, barely keeping its nose above water. Rescue workers were able to place a harness around Magic's body early Friday morning and tried to lift him out of the hole, but his back legs were stuck in the mud. He eventually died from internal injuries. "Their horses were their family," family friend Michelle Grossman said. "They would rather have had their house go then their horses." Bob and Dee Dee Bonwit - who moved into the house about 20 miles north of Orlando six months ago - were also missing a cat Friday, Grossman said. They have two other horses, which were not in the barn. 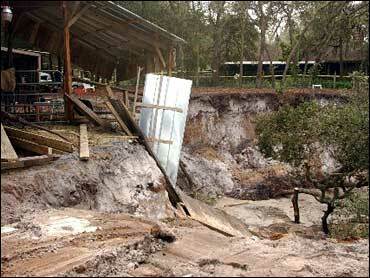 Bonwit's house is close to the sinkhole, but authorities could not say if that structure was in danger. Sinkholes occur when sand beneath the surface begins to erode and falls into underlying limestone cavities, causing the surface to collapse. Several factors may contribute to the collapse, including drought, excessive water pumping, traffic, construction or heavy rain. The geology of Florida makes it especially vulnerable to sinkholes, although they also are found in Texas, Alabama, Missouri, Kentucky, Tennessee and Pennsylvania.